Being an only-child, I never had a brother. Even so, I can appreciate the point of this old saying. For there have been times in my life, however brief, that I have had the privilege and joy of having a relationship with another guy with whom I could trust completely; much like David and Jonathan had (see 1 Samuel 18:1-4 et al.). Unfortunately, since I have repented of my former way of living and have placed my trust in Christ, I have had no such relationship with another guy. For some reason, it has been my experience that men in the body of Christ seemingly resist such a relationship. I can only guess as to why, but I did have one brother in Christ tell me that he had trusted and opened up to another brother in Christ and his trust was betrayed. As a result, he was unwilling to risk trusting anyone like that ever again. To me, that is a tragedy. For if we cannot trust one another in the body of Christ, how can we profess to be disciples of the One who laid down His life for us? In so doing we deceive ourselves and the truth is not in us! For Christ said that to love one another as we love ourselves comes second only to loving God with all our heart! 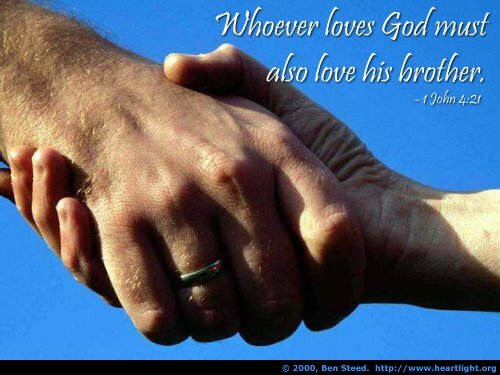 "…for he who does not love his brother whom he has seen, cannot love God whom he has not seen. And this commandment we have from him, that he who loves God should love his brother also." So let me ask you, do you love God? Do you love your brother also? Are there one or more other guys in your life that you have placed your complete trust in and that can trust you completely? If the answer is yes, are you (and they) teaching others to do the same? Remember, Satan relishes division in the body of Christ, and as long as you are keeping yourself at a safe distance from your brethren, you are doing the will of Satan, instead of the will of God. See what love the Father has given us, that we should be called children of God; and so we are. The reason why the world does not know us is that it did not know him. Beloved, we are God's children now; it does not yet appear what we shall be, but we know that when he appears we shall be like him, for we shall see him as he is. And every one who thus hopes in him purifies himself as he is pure. Everyone who commits sin is guilty of lawlessness; sin is lawlessness. You know that he appeared to take away sins, and in him there is no sin. No one who abides in him sins; no one who sins has either seen him or known him. Little children, let no one deceive you. He who does right is righteous, as he is righteous. He who commits sin is of the devil; for the devil has sinned from the beginning. The reason the Son of God appeared was to destroy the works of the devil. No one born of God commits sin; for God's nature abides in him, and he cannot sin because he is born of God. By this it may be seen who are the children of God, and who are the children of the devil: whoever does not do right is not of God, nor he who does not love his brother. For this is the message which you have heard from the beginning, that we should love one another, and not be like Cain who was of the evil one and murdered his brother. And why did he murder him? Because his own deeds were evil and his brother's righteous. Do not wonder, brethren, that the world hates you. We know that we have passed out of death into life, because we love the brethren. He who does not love abides in death. Any one who hates his brother is a murderer, and you know that no murderer has eternal life abiding in him. By this we know love, that he laid down his life for us; and we ought to lay down our lives for the brethren. But if any one has the world's goods and sees his brother in need, yet closes his heart against him, how does God's love abide in him? Little children, let us not love in word or speech but in deed and in truth. By this we shall know that we are of the truth, and reassure our hearts before him whenever our hearts condemn us; for God is greater than our hearts, and he knows everything. Beloved, if our hearts do not condemn us, we have confidence before God; and we receive from him whatever we ask, because we keep his commandments and do what pleases him. And this is his commandment, that we should believe in the name of his Son Jesus Christ and love one another, just as he has commanded us. All who keep his commandments abide in him, and he in them. And by this we know that he abides in us, by the Spirit which he has given us.